My mom brought a bread machine in NZ a while ago and since then she’s been just ga-ga about it and become all earthy by baking a new kind of bread loaf every weekend. This Bawi bride ofcourse doesn’t have a bread machine but it inspired me to get some yeast and try making my own yummy bread – Focaccia – that I could brag about. I also had some ready-made seekh kebabs lying at home that I didn’t know what to do with so the Seekh Kebab Focaccia was born – and oh what a success it was! In a steel bowl, add in the olive oil, pepper and 1 cup of flour and mix well to get the slight peppery flavour. Once the yeast is ready, pour it in and then slowly add flour 1 cup at a time, making it into a soft sticky dough. 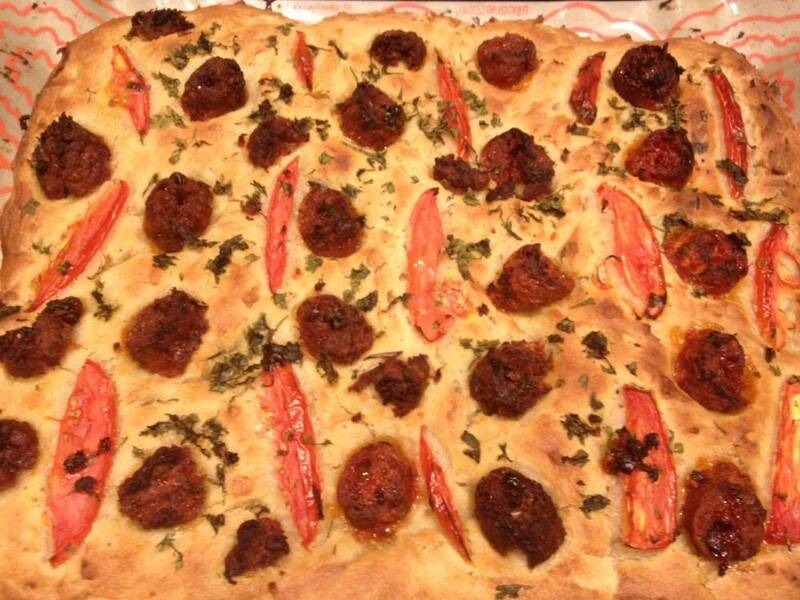 Serve the hot Focaccia with Amti-ni-Dar or smash one of Grandpa’s Kheema Kebabs on top of it for double meaty goodness. It also tastes great with melted cheese the next day.